Spring 2010 edition Greyhounds As Pets newsletter 'Fast Friends' featured an excellent article written by the previous GAP Director Jacqui Eyley (who has moved on , but is still a member of GAP Board of Trustees). I have been thinking of featuring this article here for ages -finally, here it is. Have a read - gives a food for thought, interesting statistics and also tips on how to promote adoptions of our gorgeous hounds. I have highlighted some of the most startling facts. Occasionally people ask me whether we’ve reached saturation point. “Does everyone who might want to adopt a greyhound now have one?’ Well I’ve always thought that couldn’t possibly be true because everyone who likes dogs would have one! Not to mention all those people we’ve met who told us they don’t really like dogs but have gone on to adore their greyhound. But my Board like me to come up with facts so I’ve been doing some maths. According to a survey undertaken by a pet food manufacturer, New Zealand has around 600,000 dogs and, according to the internet, the average lifespan of a dog living in the western world is 12.8 years. The same site tells us the average age for a greyhound is 13.2 years, so longer than average – that’s good news! So by my working that means 46,875 dogs are bought, adopted or otherwise acquired each year in New Zealand. If just one percent of those dogs were greyhounds then we’d be well on the way to caring for all of the greyhounds needing homes each year. If we could make it two percent then we’d be haranguing trainers to give us their dogs as soon as they were looking the slightest bit slow. So there you go, it can’t be that hard can it? It’s not like we’re trying to find homes for the Chinese Crested! Our greyhounds are beautiful, sleek and elegant. They have a long and noble history as the favoured pets o pharaohs and the kings of England. They’re intelligent and affectionate. They are capable of breathtaking speed (18 metres per second according to Wiki) and can out-race any dog, paws down, at the park; but they’re happy to snooze when we’re busy. Perfect! So here is our challenge: just one percent, ladies and gentlemen." I always knew that the number of ex-racers retiring every year (and needing pet homes) was very small (in fact negligible) compared to thousands of puppies in puppy mills and thousands of poor cross breed pups who are product of owners not desexing their dogs. The number is also negligible compared to number of purebred dogs from legitimate breeders who sell their puppies to the market. Nevertheless, it was great to see some concrete numbers. One percent ! It is amazing. 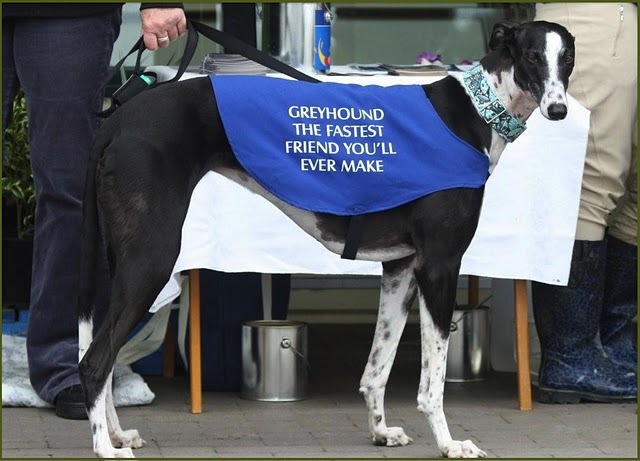 If we reached 2% - I think GAP would need volunteers at every greyhound racing track, waiting after the races and taking slow dogs to the adoption programme THEN AND THERE. This is quite often the case overseas, where ex-racers are known as great pets. My own estimate is that if we reached two percent, we would have problems getting enough greyhounds off the trainers to satisfy demand! When you adopt a retired racing greyhound, you adopt a much loved , top athlete, who was trained and dearly loved by its trainer. Certainly in the past in New Zealand, greyhounds have not been considered when choosing a pet , unlike in Europe and the USA, where they have been known as great pets for decades now. In New Zealand, as greyhound adoption is relatively new concept, there are still lots of misconceptions about the breed. I am sure that many of GAP owners have been asked hilarious questions by others: whether greyhounds needed hours and hours of exercise every day, whether they were agressive because they race muzzled, whether they would bite children, whether it was safe to have a greyhound living with children, whether they needed loads of outdoors space and huge sections, whether they are able to live inside the house (!) etc. Take your greyhound with you. Our best advert is the hounds themselves so if you’re going somewhere dog-friendly then take your hound along. He’ll enjoy the outing and people will become more aware that greyhounds make great pets. Dog-friendly cafés are an ideal spot and sipping your café latte is a great way to carry out charitable work. Wear your vest with pride. We’ve sold a lot of our little blue promo vests but is everyone using them? Putting on your dog’s vest when out walking will help him get noticed and makes you more approachable to people who might want to know more. Obviously make sure your dog is behaving himself when wearing it!is the best advert in the world – please make the most of him. Give out our GAP cards. space for your local contact’s details on the other. Next time someone asks about your hound, give them a card and tell them to visit the website. Pin leaflets and cards up on noticeboards. image. Ask if you can pin a leaflet or a card on any noticeboard you see. It could be at the vet’s, the pet shop, a café, a community centre, the possibilities are endless. If there’s an event in your area at which you think we should have a GAP Stand, then tell us. Local markets and street fairs are often just as effective as big Expos and are lot cheaper. You could also help at the stand for an hour or two which would be even better! There are many ways we can promote our hounds but your help is invaluable. 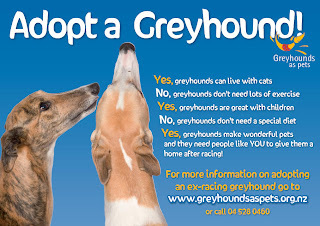 After all, your greyhound is the best advert in the world – please make the most of him." Dog Clubs are places where dog lovers meet. They attend various classes with their dogs, and network between themselves and other clubs. Take your greyhound to a dog class to your local club. We need more greyhounds present in dog clubs (classes) in order to raise the breed awareness. Yes, greyhounds are very trainable IF you choose the right class. I highly recommend 'Canine Good Citizen' (CGC) classes, which are perfect for greyhounds as they are nothing like old-style rigid dog obedience classes which hounds typically hate. Both our greyhounds have CGC certificate (Lucy even has Bronze and Silver level, she is currently training for Gold). I have written about Canine Good Citizen classes before, you can find all the details you need here. Post about Lucy passing Gold and Silver CGC exams is here. Rally O (Rally Obedience) is another class I would recommend. Our greyhound Lucy has a Silver Medal in this and loves the classes! You can read about it in one of my previous posts, here.